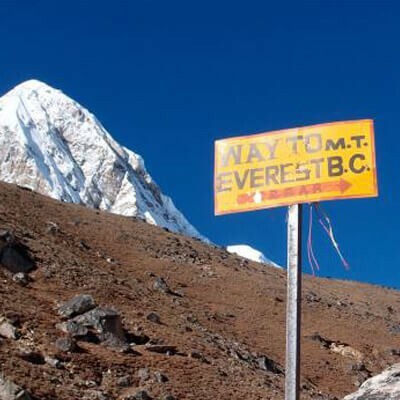 There are plenty of trekking options in the Everest Region. All of these treks will take you quite close to the Himalayas of this region. But Gokyo Lake trek is a unique trail in this region as it takes you to the beautiful lakes of the Gokyo valley. From these lakes, you will get mesmerizing views of the mountains like Everest, Cho Oyu, Makalu, and Lhotse. Gokyo is a picturesque village in the Himalayas of the Everest region. It is located at an altitude of 4750 meters at the base of Gokyo-Ri peak. It is a settlement located at one of the highest points in the world. Most of the buildings here serve as tea houses or lodges for trekkers. Gokyo is one of the most awesome valleys in Nepal. The lakes that are present here are known as Gokyo Lakes. The five lakes here from a part of the highest freshwater lake system in the world. These lakes are located at altitudes between 4700-5000 m.
As a part of the Gokyo Valley trek, you will also trek to Gokyo Ri. Gokyo Ri is a high peak in the Everest region and has an altitude of 5357 meters. This is also the highest point along your trek. Gokyo Ri is one of the best places in Nepal for viewing sunrise and sunset. Gokyo Ri lies in the western side of Ngozumpa glacier. This glacier is the largest glacier of the Himalayas and of Nepal as well. The wonderful lakes, beautiful peaks, and a gorgeous view of mountains and sunrise make Gokyo Valley a popular trekking destination in the Everest region. Gokyo lakes are some of the most beautiful lakes in the high altitude regions of Everest. The turquoise blue waters of these lakes are mesmerizing. In addition, the views of the surrounding mountains of the Himalayas of Everest from the 5th Gokyo lake are awesome. Makalu, Everest, Choyou, Lhotse, Nuptse, Pumori, Makalu, Amadablam, Cholatse, and Kwangde can be seen from Gokyo Ri. Ngozumpa glacier lies below the sixth highest peak in the world - Cho Oyu. The glacier is 36 kilometers in length. This is the largest glacier in Nepal. 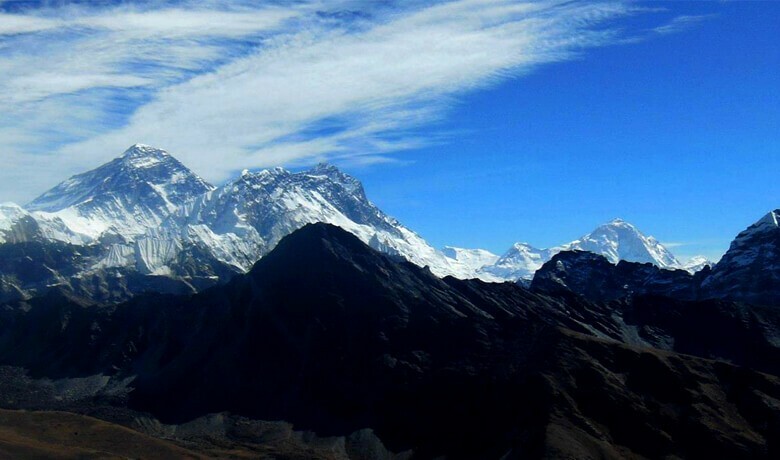 During Gokyo Valley Trekking, you will get splendid views of Ngozumpa glacier. Gokyo Valley Trek gives you mesmerizing views of the mountains of the Everest region. The flight from Kathmandu to Lukla is full of bird's eye view of the mountains like Everest, Cho Oyu, and others. In addition, other vantage points like Gokyo 5th Lake and Gokyo Ri are beautiful places to view the mountains here. Our office representatives will be there to receive you at Tribhuvan International Airport in Kathmandu. They will have a signboard that reads “Sublime Trails”. This way you won’t have any problems locating us. They will transfer you in a private vehicle to your respective hotel. If you don’t feel tired, you can stroll around some bazaars of this ancient city. Thamel is a very popular commercial neighbourhood where many tourists choose to spend their evenings. It is a locality with wonderful restaurants and sound ambience. 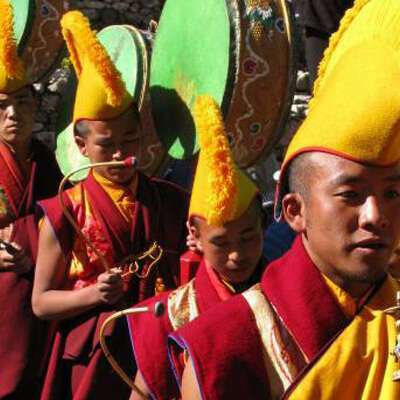 From Namche Bazaar, you will trek through pine forests and vibrant settlement of Kyangjuma. You will leave EBC Trek route and take left turn uphill trail towards Mongla Hill. The trail is quite steep and continuously follows the Choyou Mountain on distant. Cholatse mountain will be your companion on the right-hand side. You are likely to encounter occasional bushes and narrow trail at the hills. After about 6 hours of walking, you will reach Dole. Dole is at the foothill of tall hills and on banks of a stream. From Dole, you will head out to Machhermo. This trail up to Machhermo takes a gentle uphill slope. Along the way, you will get scenic views of Cho Oyu, Kantega, and Thamserku. Machhermo has an altitude of 4470 meters. From Machhermo, you will descend to a river bank. From there, you will climb up the moraine of Ngozumpa glacier and reach the 1st Gokyo Lake. You will then follow the rugged terrain of the first mountain and reach the 2nd and 3rd Gokyo lakes. You will stay in a guesthouse in Gokyo. This day will be on the highest point along the trek i.e. Gokyo Ri. It has an altitude of 5357 meters. From Gokyo Ri, you will get to witness mesmerizing views of sunrise. So you will head out to Gokyo Ri early in the morning. You can get a panoramic view of mountains like Makalu, Everest, Choyou, Lhotse, Nuptse, Pumori, Makalu, Amadablam, Cholatse, and Kwangde from Gokyo Ri. 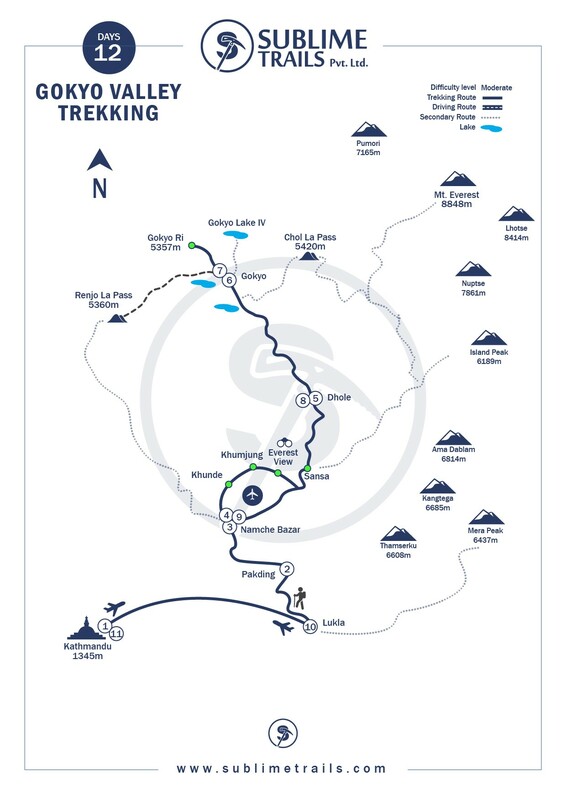 Then you will head out to the fourth and fifth Gokyo Lakes. The fourth and fifth Gokyo Lakes are quite close to each other and lie almost 2 miles north of Gokyo. Ngozumpa glacier and Cho Oyu Base Camp are visible from the northern part of the 5th Gokyo Lake. You will hike up a hill nearby which is called Scoundrel’s Viewpoint. It is another wonderful point for viewing the mountains of this region. From Gokyo, you will head back to Dole. You will pass the first Gokyo lakes on a trail that takes you along Dudh Koshi river. You will walk through quaint villages like Machhermo, Luza, and Lhafarma. Along these villages, you will also get great views of mountains like Thamserku, Cho Oyu, and Kangtega. After walking around 3-4 hours, you will reach Dole, where you will stay the night. On your way to Namche Bazaar from Dole, you first trek to Phortse Thanga. The trail to Phortse Thanga is steep and full of beautiful rhododendrons and waterfalls along the way. You will also come across some animals and birds of this region along the way. On your way to Namche from Phortse Thanga, you will be accompanied by views of mountains like Taboche, Ama Dablam, Thamserku, and Kangtega. After you reach Namche, you can stroll around the market of Namche Bazaar. Finally, you will return to Lukla from Namche Bazaar. You can also reflect back on the time you spent trekking and cherish the wonderful memories you made along the way. You can explore the surrounding towns in Lukla if you have some spare time. The next day, you will take a flight to Kathmandu from Lukla. 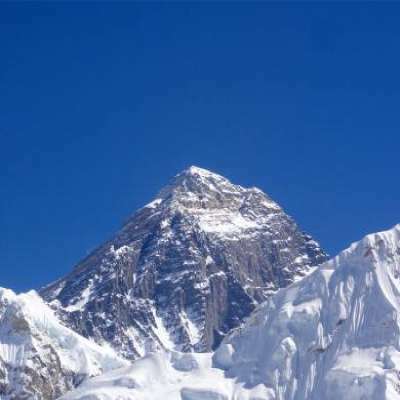 This flight will be your last chance of the trip to be astounded by the beauty of the mountains of the Everest region. This 35-minute flight will land in Tribhuvan International Airport, Kathmandu. From the airport, you will be transferred to your hotel where you can. In the evening we will provide you an excellent farewell dinner in a traditional restaurant in Kathmandu. In the restaurant, there will also be a wonderful cultural dance performed by female and male artists of Kathmandu. Our airport representative will drop you at the Tribhuvan International Airport for your departure from Nepal. It was a pleasure serving you at SUBLIME TRAILS. If there are other places you would like to explore in Nepal, please let us know. We hope the relationship developed between us will extend to further visits to this amazing country of Nepal in the years ahead. We would like to wish you all the best & a safe journey home. Highly recommended. My travel to Nepal is one of the most incredible memories I bring in my hearth. Nature is outstanding and the mountains are so powerful. Ram was a great guide, highly organised, flexible and really competent. Can't desire any better. Really an outstanding experience.